18:00 I arrived in Hebron repeating the simple instruction over in my head “get out of the bus at Happy Bunny Restaurant”. However many times I said it in my head I just couldn’t quite bring myself to mutter these words out loud. Inevitably the time came when the driver turns and questions, “where”? I respond, “Err…Happy…Bunny…restaurant”. He beams a smile, “of course”. I am whisked to my destination and my nights’ accommodation (a house close to the restaurant, not the restaurant itself). 22:00 Stood in the centre of the closed part of the old city in Hebron I look at some 3,000 year old remains of ‘ancient Hebron’. It looks like rocks to me, but I will concede that they look like slightly more useful rocks than the really old ones by my house in the UK (Stonehenge). We are stood a few meters from one of the settlements in the middle of Hebron and just down the road from a Israeli family who are due to be evicted in the coming weeks (tensions are high). A soldier approaches us and asks where we are going and before I can answer looks over his shoulder and says, “oh the cave”? (or it could have been “grave”, I wasn’t sure). I, possibly foolishly, replied “yeah the crave” (hedging my bets between a cave and a grave). He then radio’s in to see if it is ok for us to go and look at the cave/grave. After a few minutes of the soldiers having a ‘boy competition’ (defined universally as making a competition out of something that really shouldn’t be a competition, eg – hitting a balloon to each other becomes “can we hit it to each other 100 times with just our left hand” or in this case “who can shine their lazer on their rifles the furthest”) they decide that it is OK to go look at the cave/grave. We smile and walk to the dead end. 25 meters up the road and we see 6 soldiers waiting outside a military base next to the before mentioned settlement. I tried to casually scan where I was as if I of course know exactly where the cave/grave is. One soldier nods his head towards the far corner. Two options present themselves, the first is the military base and the second is a Palestinian families house. My colleague takes control and walks confidently into the Palestinian house where she knows the family. We stop and say our hellos to the family and ask about this cave/grave…apparently it is where someone from the old testament is buried and it is inside the military base. I leave the house still not sure if it is a cave or a grave but figured I had bigger fish to fry. I didn’t have the nerve or inclination to walk back out onto the street so we slump off down the path at the back of the house. If nothing else it is nice to see the IDF trust us enough to enter into a military base unaccompanied at ten o’clock at night. On the way home we see three Palestinians being held up at the checkpoint at the top of Shuhada Street. We stop and monitor the situation. If they are held for over 20 minutes we call the Temporary International Presence in Hebron (TIPH) for support before calling the ICRC. Inevitably the soldiers releases the men after 18 minutes. As we pass the soldiers there is an awkward acknowledgement that these were the same soldiers who had just given us permission to enter their base to see the cave/grave. I try to keep it nice and ask “is it ok to go into the ‘crave’ anytime”?. The soldier looks at me alarmed, “you want to go into the grave”? 23:00 – I fall asleep under a purple Disney duvet. 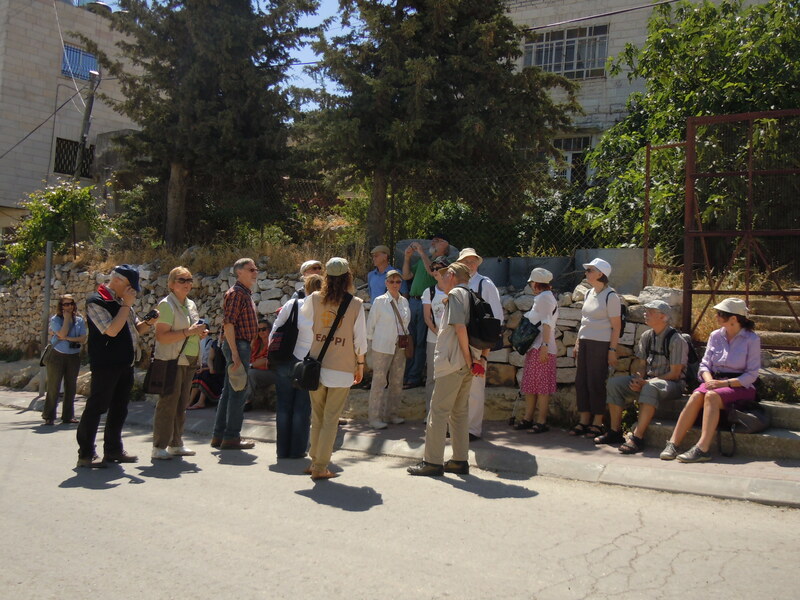 08:00 – We are up at the crack of sparrows to meet a German delegation who want to be shown around Hebron. I stay mainly quiet as my colleague waxes lyrical about Hebron in what I felt to be an impressively neutral manner. We show them around the mainly closed and divided parts of Hebron. There is one street divided by concrete bollards less than a meter high where Palestinians walk one side and Israelis the other. I wondered what on earth this form of division had to do with security. 12:30 – After everything that could be said about Hebron has been said we left the German’s to make their way pass a checkpoint into the old souq. I see at least three of them tut at the soldier on the way past. I make a conscious note that I need to work on my middle class indignation. 13:00 – I see a character walking towards me down Shuhada Street. He looks Israeli, but doesn’t look like one of the settlers living in Hebron (he’s smiling to start with). My inner suspicions are aroused though when he asks where we have just been. I pull out the leaflet I picked up by Abrahams grave (although interestingly he was also meant to have been buried in a ‘cave’ – all very confusing) and thrust it into his hands. Triumphant in the fact that I had not only been to a tourist hot spot but I had proof that I had been into the “Jewish half” of the mosque/synagogue/holy site (don’t ask…Jews and Muslims go in separate doors and can see the same grave/cave but from different sides and are separated by bullet proof glass). He looks at it and mutters he hasn’t been there yet. I am a little disappointed but crack on with conversation. He turns out to be called Michael and lives just to the South of Tel Aviv. Apart from being a bloody nice guy he also enjoyed liberally sprinkling in words like ‘Plato’ and ‘Power Dynamics’ into conversation. In other words, he was my sort of chap. He described himself as “on the left” of Israeli politics before he rubbished the very concept of ‘left and right politics’ in Israel. He was passionately ‘Jewish’ (and trust me when I say we didn’t use this term lightly, about half of our conversation was on how to define ‘being Jewish’) and to say he was well read was an understatement. About three hours of conversation in the heat of the day later we decide to go and grab some food…he chooses the Gutnick Centre (a Jewish cafe and community centre in the centre of Hebron that is known to the International community as being ‘pro-settlers’). On the way to lunch Michael wants to walk on the ‘Palestinian side’ of the divided street. I am interested to see what happens so don’t stop him. When we get to the soldier at the top, the soldier tells him he is “lucky to escape with his life”. Michael smiles and we go and drink coffee with some ‘dangerous’ Palestinian shop keepers. We take off our EAPPI jackets in the shop and leave them there before going into the Gutnick centre. This was to avoid provocation but we are also not allowed in wearing the vests. Dangerous pacifist peace workers? We sit down on a table opposite some soldiers and have a nice lunch. Sometimes the word ‘surreal’ just doesn’t quite cover it. 16:30 We walk together after lunch and are about to say our goodbyes to Michael when in the distance we spot two soldiers who were completely covered in white paint. They stride past a ‘normal’ soldier who tries to stop them. The ‘white soldier’ tells him to “check with command, this operation is cleared”. I had no idea what was going on. 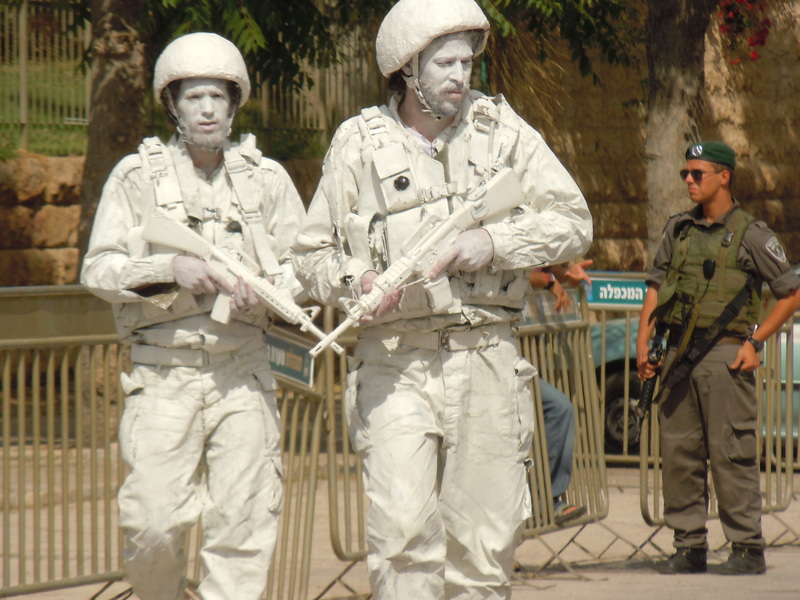 A soldier stood with the ‘white soldiers’ turns to me and says, “it’s art…it is up to you how you interpret it”. I liked the idea and so walked with a growing crowd of both Palestinians and Israelis. The soldier now turns to me and asks if I have ever been to Jayyus, I say “yes”. He gets his phone out and shows me a picture of myself from one of the day time raids of the village I used to be based in. He smiles and clearly thinks this situation is hilarious. He asks as if reuniting with an old school mate, “how you been keeping dude”? I smile, “yeah good cheers”. By this point we have walked to the outskirts of one of the settlements. I ask the soldier if it is ok for us to be there and the soldier and Michael respond in unison “of course”. The ‘white soldiers’ are now pretending to search a playground and I watch on in fascination. This was not something I had expected from Hebron but I was enjoying myself. In a split second however this whole jubilant atmosphere was shattered by the one and only Anat Cohen – a notoriously aggressive settler. She came out of a house and started screaming at me (ignoring the Israelis I was with) and stamping on my ankles. As she screamed at me I felt flecks of her saliva land on my face. I consciously decide not to wipe it off because I don’t want to be accused of ‘raising my hand’. I looked over her tiny angry shoulders to the soldier looking on. He gives me a comic shrug and looks helpless. I say it is OK, and we will go. The four of us (three internationals and Michael) walk off. She (Anat Cohen) follows me pushing me in my back and shouting. The soldier walks on behind and signals to his colleague in the distance to come. The new soldier asks, “did you do anything”? I smiled and said “of course not”. The soldier tuts a knowing tut and we walk for another 200 meters with Anat Cohen following me stamping on my ankles and screaming at me. While the soldier does nothing. When we stop to enter into a ‘Palestinian only’ part of town we finally say goodbye to Michael and Anat Cohen stares at us both and takes our photos. I feel really sad that someone could feel that much anger and hatred to a stranger that she has never met or spoken to. I feel worse though for anyone that has to put up with her day in day out. Michael, the soldier, Anat Cohen, the history, the conflict, the division…all just 24 hours in Hebron. i) even under the British, the old Islamic apartheid prevailed, whereby neither Jews nor Christians could enter the Cave of Machpelah, even though, not only is this the second holiest site in Judaism, the actually building in which it is enclosed is an Hellenistic Jewish Herodian one, dating to the Second Jewish Commonwealth. ii) most Jews were effectively driven out in 1929, while the 160 who returned in 1931 had to live within a British garrison, and were transferred out in 1936 as too difficult to protect against the Palestinian Arab rebels. iii) it is only by means of military conquest and protection that Jews were able to return to Hebron in 1968 and continue to live in the numbers they do. That does not justify abusive settler behaviour (and they have been subject to local attacks ever since 1968, hence the army), and the situation does seem to attract more than its share of Jewish hooligans (though how representative they are, I do not know: to live in such a place and situation does require a drive/motivation/stones). When persons such as Robert Fisk comment on how Palestinians and Israelis are allotted different days and places of access, with evident anger and indignation, I comment help but recall that Israel, for all its sins, yet grants Palestinian Arab Muslims more access to the Cave of Machpelah than Palestinian Arab Muslims +ever+ granted Jews. Which does not change what I said in a) at the outset. Wow, Steve! The Jayyus story was creepy. More details? Fascinating read, Steve. Thanks for keeping your posts so frequent I’ve been enjoying them.